Tagging friends in photos and videos on all of our social networking outlets has become a regular daily activity, something that we rarely even think about anymore. But a start-up company called Viewdle wants to make it even simpler by taking the whole task out of the user’s hands and doing it automatically. And in case you’re out and about and want to know what your friends tweeted about your outing when they snuck off to the bathroom, just point your Viewdle-enabled device at them and the augmented reality display shows you information about their last tweets, Facebook posts, LinkedIn profile or any other relevant information from their social networks. Of course, the user does have to teach Viewdle who everyone is at first…but after that, Viewdle takes over and uses visual recognition to supply details about your surroundings and companions. And no matter how many devices you use Viewdle on, you’ve only got to teach it once, then sync it to the rest of your devices. 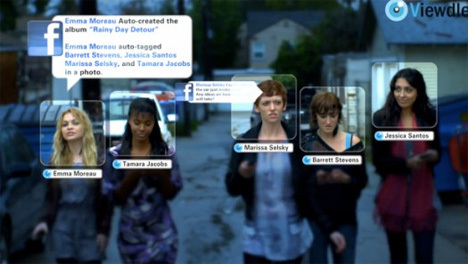 You can even share your “faceprints” (records of your friends’ faces) with other Viewdle users. See more in Science Fiction or under Science. March, 2011.